Comprising a crisp, clean design, Edwardian conservatories offer a generously sized floor plan to allow you to utilise more space. A perfect option for get-togethers and conservatory furniture. We have specifically designed the Liniar conservatory roof to meet the demands of modern living. For a conservatory that is less expensive to heat, choose the Liniar conservatory roof. Unique thermal twin-walled top caps conserve more warmth within the conservatory – meaning less energy is needed to heat it. Not only this, Liniar’s conservatory roof has a centre bar that allows for more height, so the roof is less of a hazard for taller family members. The Liniar conservatory roof has been strategically designed to eliminate water ingress, so you can rest assured your new Edwardian conservatory will not leak. Created with security in mind, it’s not possible to deconstruct from the outside, either. 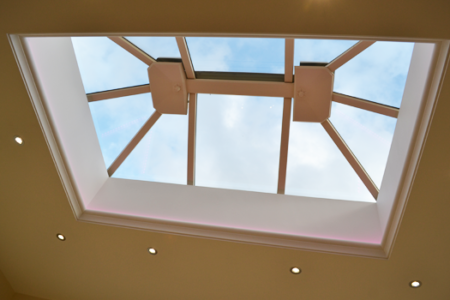 Have you considered a lantern roof for your new extension? 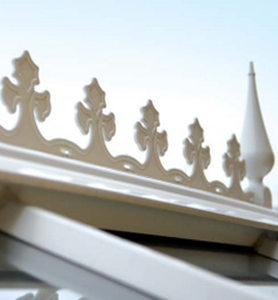 The Edwardian is a traditional strong design that lends itself perfectly to this exciting roof feature. You will gain further levels of natural sunlight for a bright interior whilst enjoying a striking focal point. Another addition that can add gravitas to your conservatory or extension is the installation of Liniar uPVC bi-folds. These stunning doors can open up an entire side of the room, providing you with a cool interior in the summer and perfect access to your property when entertaining. Bi-folding doors also look stylish and their smooth folding action makes them functional and easy to use. For more information about Liniar bi-fold doors, visit the ModLok bi-fold page. There are a number of factors to consider when choosing the material for your roof. The two most common options are glass and polycarbonate and there are different benefits to both. It is important to bear these in mind when choosing as they can make a difference to your finished conservatory, find out more about glazing options here. Broadly speaking, a glass panel roof will let in more natural light than the polycarbonate alternative and also be less noisy when it is raining. Polycarbonate roofs provide more protection against the sun’s glare. It is good to bear this in mind when thinking of where conservatory is to be built. We are proud to say that all Liniar glass conservatory roofs use Pilkington glass, one of the most established and trusted glazing suppliers in the UK. Liniar conservatory roofs can be customised with a wide selection of matching options so that you can achieve your desired finished look. The Liniar range of optional accessories includes classic and contemporary uPVC finials and cresting options for the perfect finish. Many alternative conservatory roofs don’t look ‘finished off’, with ugly structural features on display. 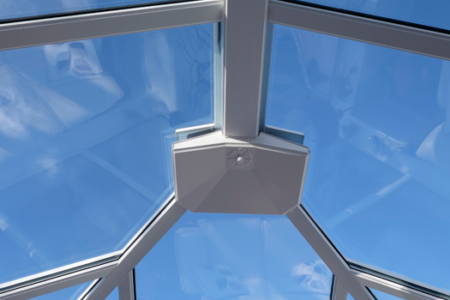 The Liniar roof features beautifully designed end caps, foiled to match perfectly and providing the ideal finishing touch to your new conservatory. Liniar’s symmetrical multi-chambered uPVC profiles mean heat transfer is minimised, using less energy to heat your home and therefore helping make energy bills lower. Why not have a browse through the Liniar range of window and door options? 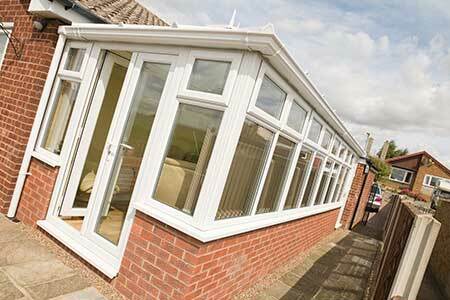 Although traditional in their design, our Edwardian conservatories have been updated to meet modern standards. This means that they achieve A+ standards of thermal efficiency. Not sure an Edwardian conservatory is the ones for you? Not to worry, have a look at the other styles Liniar offers.